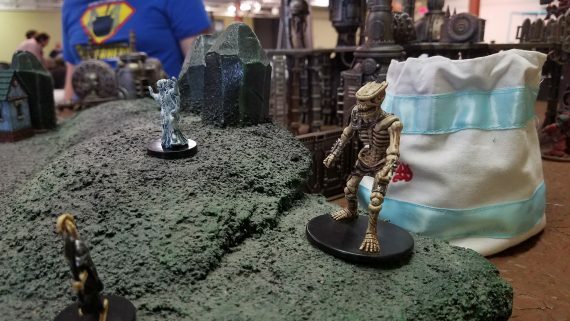 It was time for a club road trip, out in to the mysterious back alleys of Detroit, for The Midwest Miniatures Expo! Here are some visual recaps of what was going on. 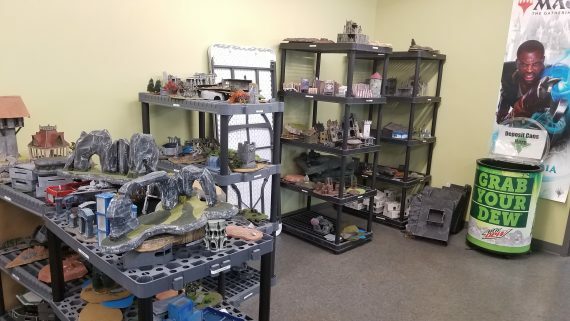 The venue itself, was Imperium Games in Wixom, MI, just outside of Detroit. 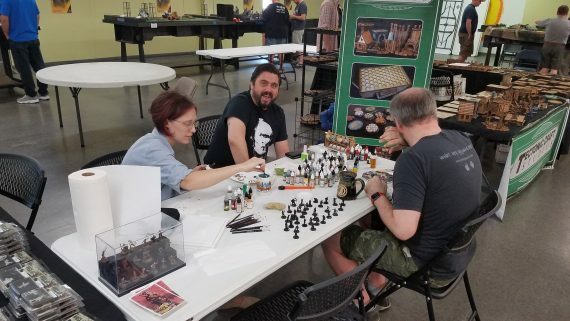 I enjoyed this venue's open gaming area, there were lots of available tables to utilize and plenty of space for gamers and onlookers alike. Very laid back and friendly people. Initially, thinking that the shop itself might not be miniatures-centric, I found that worry to be for naught! 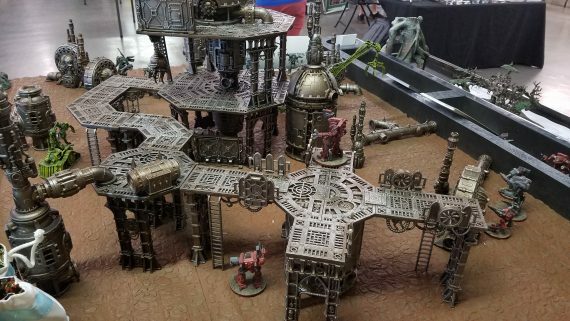 These guys had a bunch of tables and terrain for pretty much any genre. Kudos to their collection...makes my own local shops seem very sparse in comparison. The guys from Wreck Age had a strong presence here. 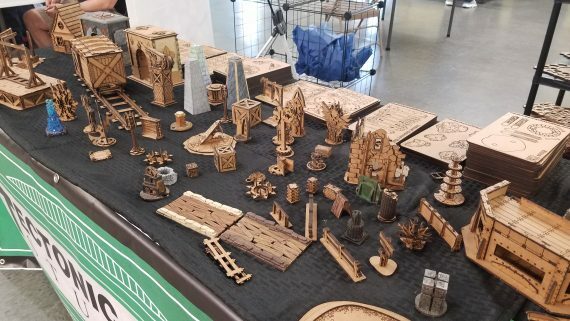 There were quite a few patrons asking about the game, hearing tidbits from various media, so many were happy to see items for sale and demos on demand. 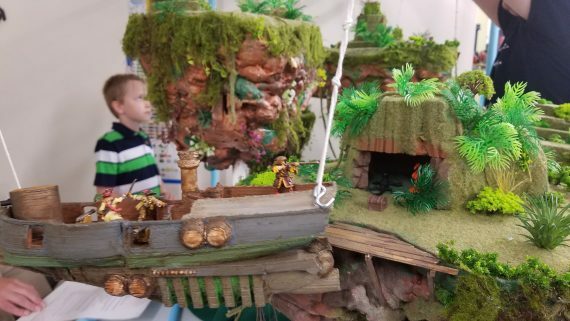 It proved to be a popular booth from what I saw. 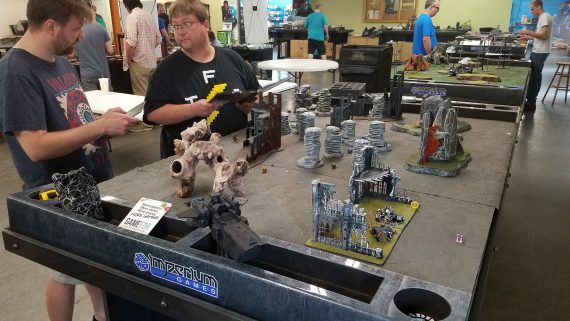 Matt from Hyacinth running a free Paint & Take for the Wreck Age booth. I always love these; lots of paints available, and being able to chat with people as they let their creative engines whirl. 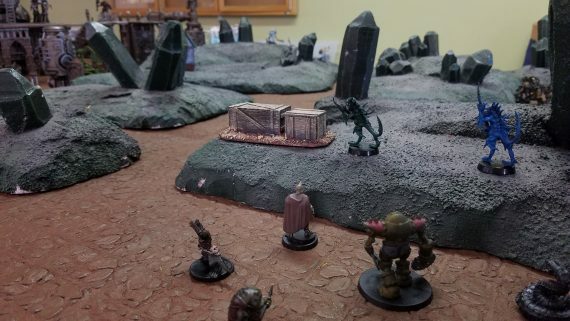 I may have participated myself...:) I found this mini to be very interesting for post-apoc. Seems like it could be used in a variety of genres. 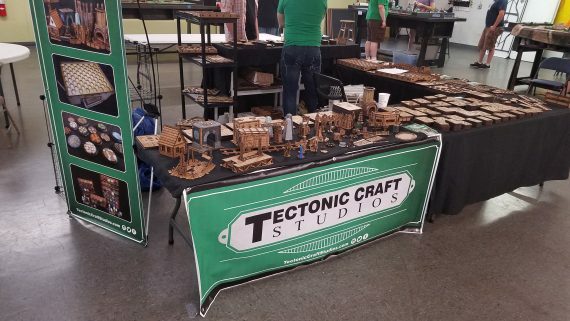 Dan from Tectonic Craft Studios had a booth here too. I remember perusing it briefly during some busy hours at Adepticon. 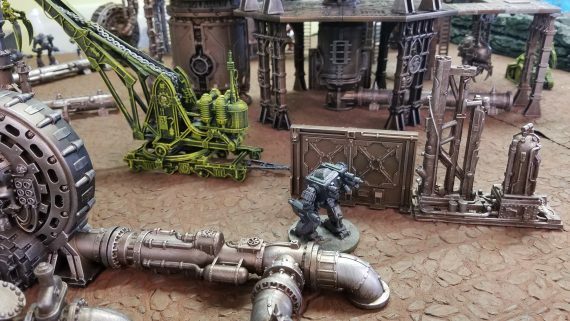 He's got a wide variety of very creative bases, markers and terrain. Definitely some talent there with some really fun pieces. 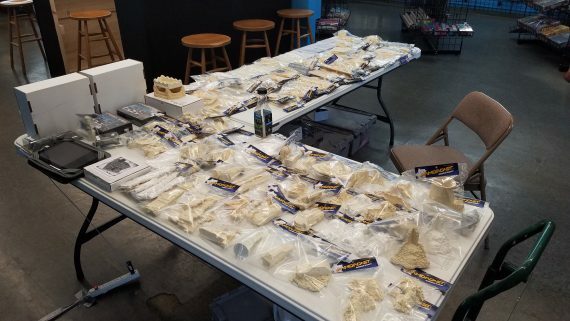 The Armorcast lad was there, selling their huge array of resin bit and terrain. Hard to resist some of this stuff...quite affordable and some great looking stuff. 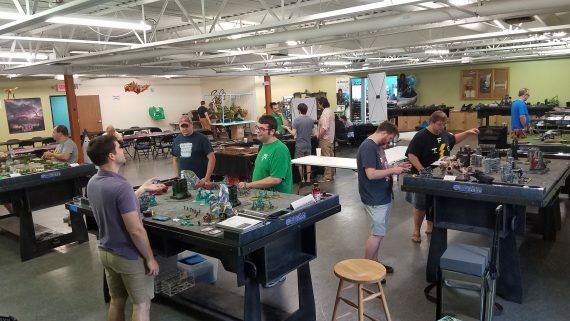 Some patrons getting set up for Warhammer. Gaddis Gaming Tabletoppers adorned most of the tables here. These proved to be pretty useful for running demos with spaces for tokens, drinks, and dice. They accomodated neoprene mats well also. 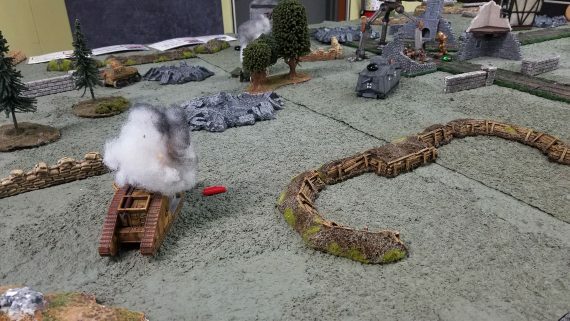 Someone was running a very unique looking airship combat game based on a pvc pipe lattice. 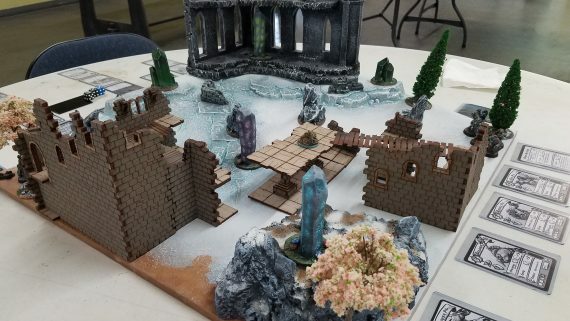 I sadly didnt get to try this, but definitely visually striking! 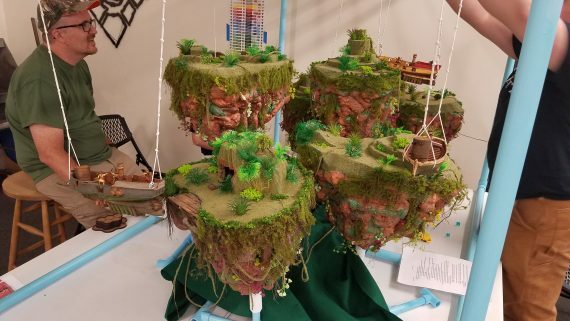 Really rad looking floating islands! 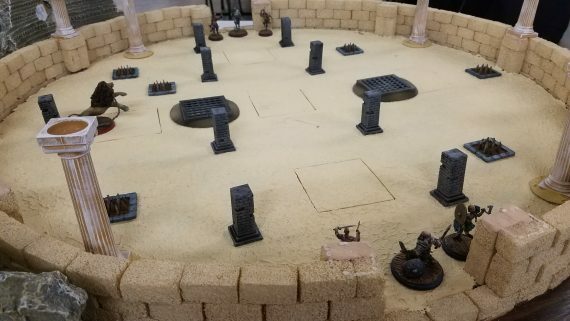 I ran an Arena Rex table initially. 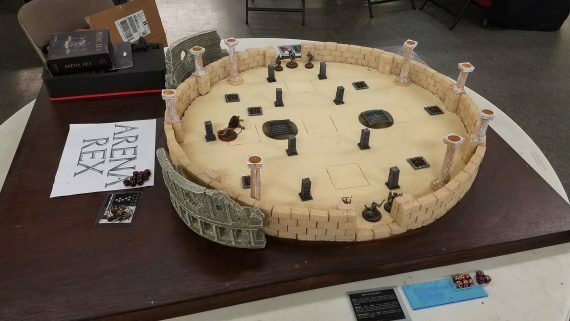 Even though I brought a table set up, it turns out there were patrons that were fans of the game so they had a custom crafted arena available! Sweet! 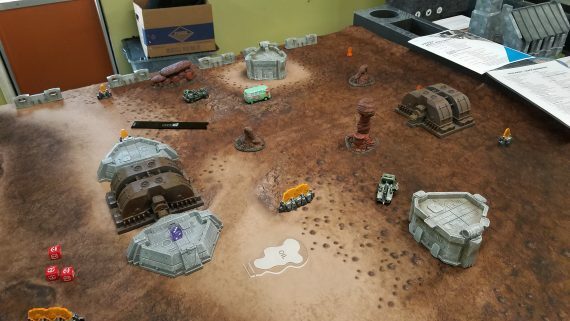 Tim set up a great table using GW terrain to run demos of Mech Attack. 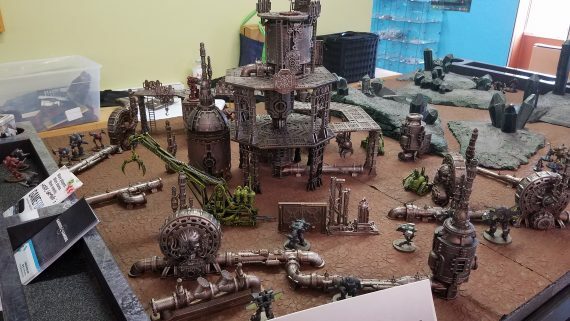 Looked great, but be sure to look for the 28mm version they run at Adepticon! 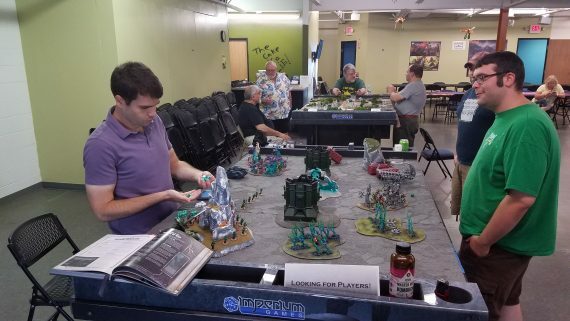 Adjacent to his Mech Attack setup, Tim also ran on demand demos of Song of Blades and Heroes, the fun casual skirmish game. 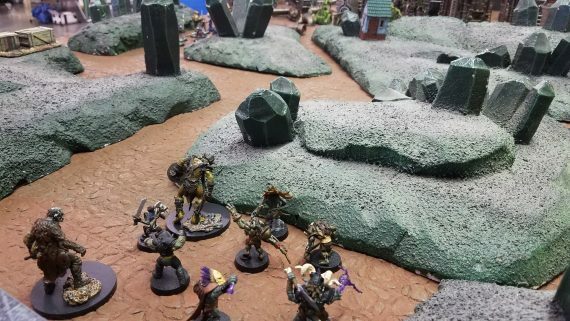 It appears he had 4 warbands available to accomodate the curious. 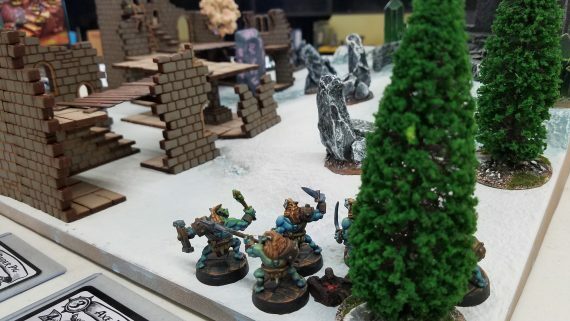 Again, the available terrain was the store was most impressive. 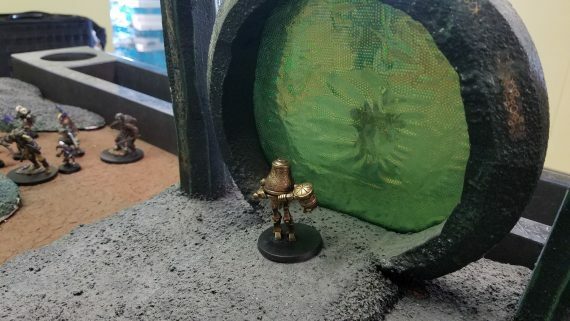 Love that Necron portal! While we were supposed to run Last Days, due to some unforeseen events we couldn't make that happen this time. 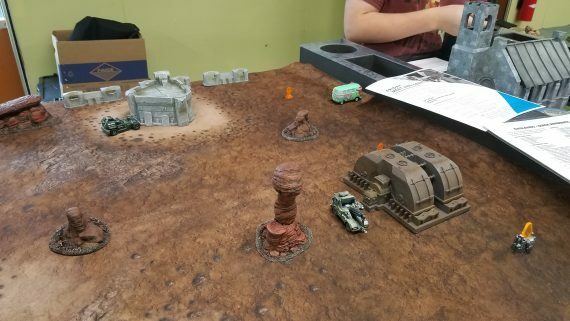 As a precaution I brought materials to run a Gaslands table if there was a demand for it....turns out, there was! It's a hot game with easy entry, so it was not difficult to get a few people to play. They all seemed to enjoy it, and I loved the chaotic moments as they happened. Good group for this one! The youngest player proved to have a wise, steady and stable winning race strategy whilst the others wanted chaos and carnage! 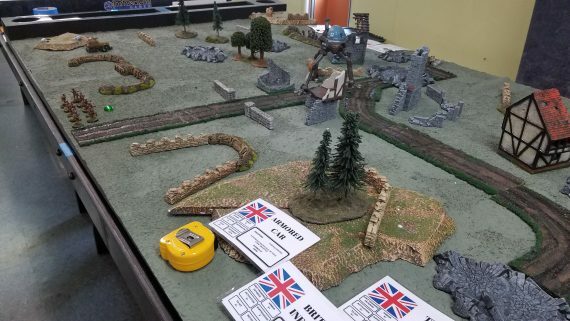 While waiting in between demos, I did get to try out Gaddis Gaming's GAURDS system wierd WWI game. Much like Song of Blades, this seems like a simple, casual ruleset with a good variety of options. 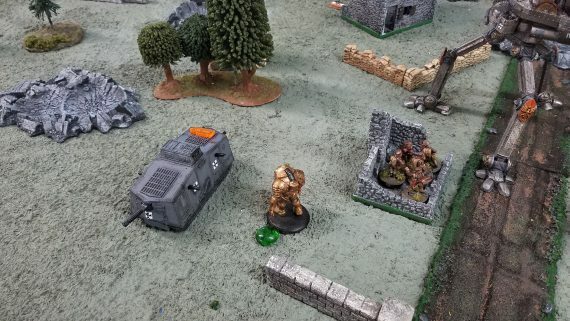 There is some randomness to how fragile tanks can be...but they are also deadly, and this gives weaker units a chance! Pretty fun demo with lots of exploding things. 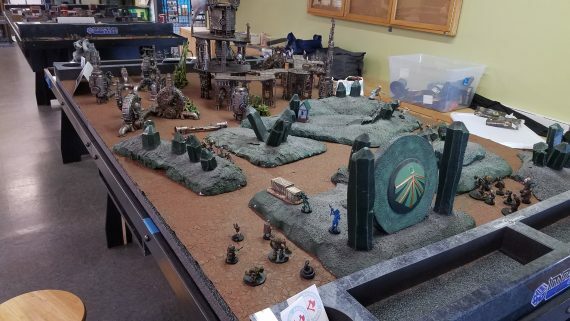 On Sunday I threw together a Relic Blade table. 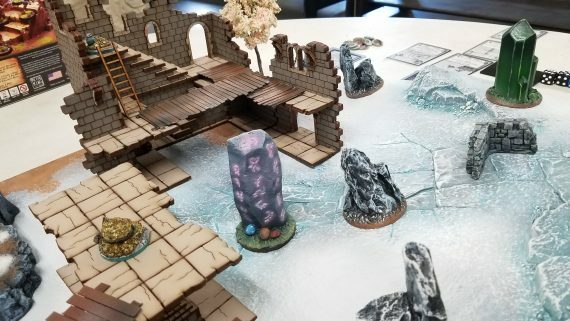 I stuck with a Waystones scenario as I find that to be quick and a nice way to get people who aren't so combative to play. I'm still fairly impressed with this game. It's presentation and relative simplicity are top notch! 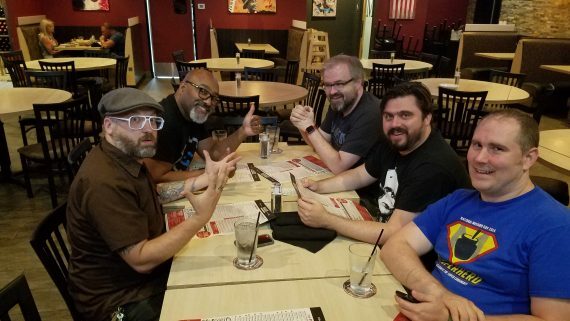 And most importantly, what would all this gaming be without hanging with the crew? 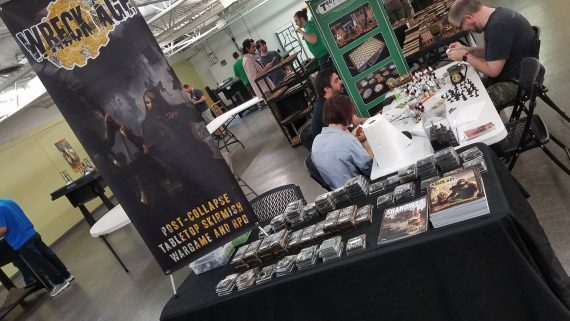 Some thoughts in retrospect: this was a relatively new event with the intent on offering some local gamers exposure towards lesser known games. 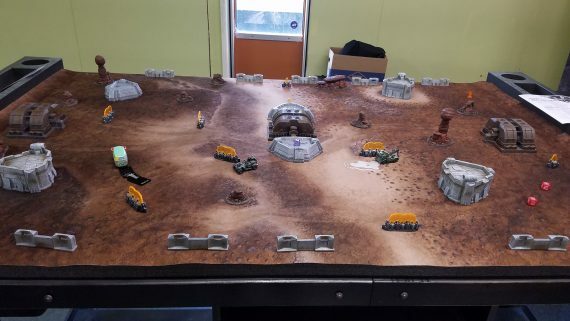 I had a fun time with the club members and vendors in attempting this goal, and there was some success from my vantage point. I was surprised that some of the games I brought to demo were already fairly popular in that meta...the store even CARRIED Arena Rex items! 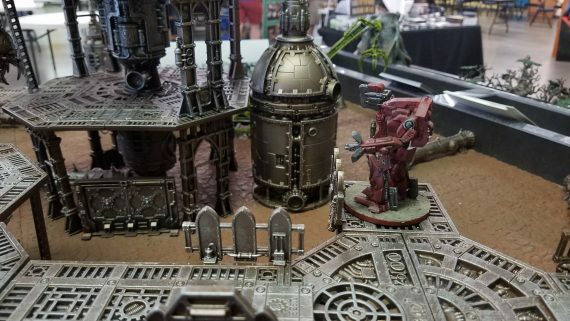 Truly shocked by that as in my area, it seems to be only the juggernauts (GW, Xwing) that retain a presence. That said, there is that issue of people being wary of change and jumping in to new territory that they feel might not get played, or is a waste of time/money. Simply giving demos is still sometimes a hard sell. 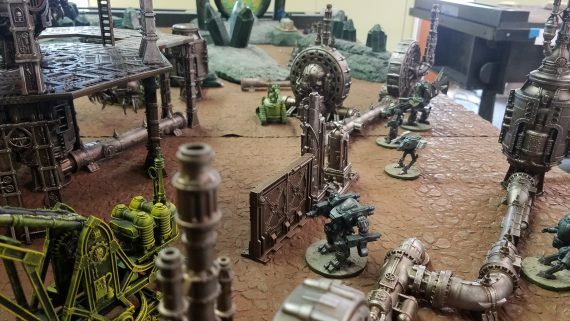 I literally talked to somebody who seemed quite interested in Relicblade, but due to limited time chose to play the trusty ol' WH40k instead. I'm ok with having that choice however. 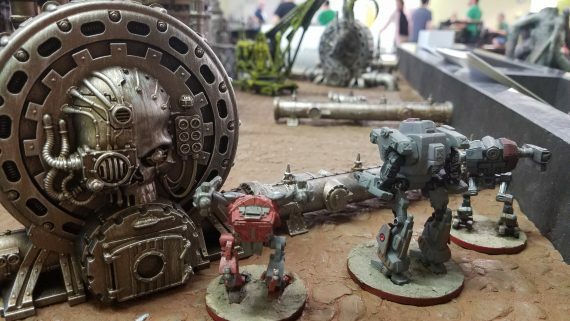 We truly live in a golden era for our hobby, with a game for every genre. There might be some individuals out there without the exposure who have that feeling that something is missing or incomplete. 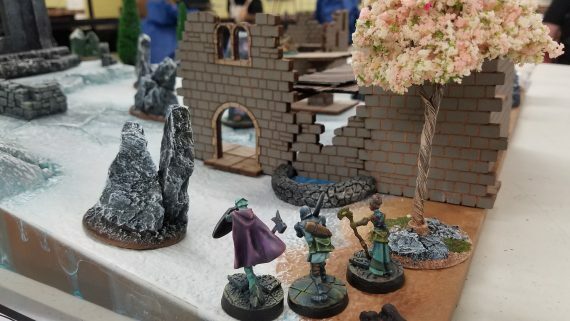 I chatted with another patron for quite some time at the painting table, and we started talking about Mordheim/campaign style fantasy games. 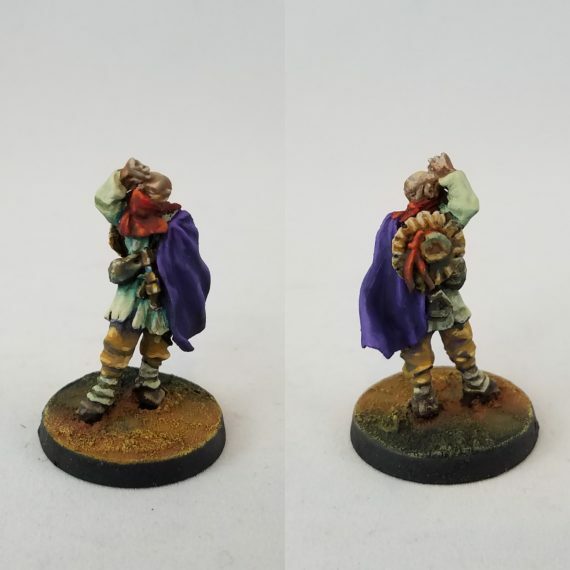 I asked if he ever heard of Frostgrave, and he had not! Being a huge fan of it myself, I gave him my giddy overview. That glimmer of genuine curiosity in his eye, like a mystical book of fantastic tales about to be opened, is exactly what these types of expos are good for! Cheers! Great write up! This makes me extra bummed I couldn’t make it. Nice report. Sounds like a great event and good to see Mech Attack and SoBH being played!